We are big supporters of kids playing laser tag, as it keeps them active and social. The Discovery Kids Spaceship laser tag guns are an excellent entry level laser tag set targeting the youngest age group. 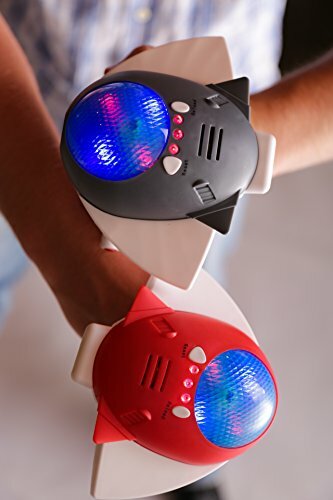 At a very competitive price, these playful toys in the shape of small spaceships boasting intergalactic sound and light effects, will not disappoint your children. This set comes with two very simple laser tag guns, one in orange and the other one in green. If you have more than two kids that want to play laser tag, simply buy multiple sets and they will all work nicely together. The guns produce no visible laser beams and are perfectly safe to use. Believe it or not, but things can actually get a bit confusing when you want to start a new laser tag game with these two spaceships. To get these two guns ready for a new battle, place them such that they are facing each other. Then hold both the red and the reset button down at the same time until the other gun starts waking up with sounds and lights. Now repeat the same process with the gun that has just woken up, pointing at the other gun, and you’re all set to go. A game ends as soon as you get hit six times. Simply reset the spaceships, and start a new battle! Okay, some may say the sound effects are great. We actually find them to be a bit on the annoying side. The sound effects are definitely there, and they are somewhat okay, but the problem is that they are always there. They do not go away during battle. Kids will probably love it, but it may just drive their parents a bit mad after some time shooting and running around. The other issue with this is also that you can’t hide from each other. But to be fair, kids that young won’t be playing with much of a strategy anyway, so this shouldn’t be a deal breaker. The light effects on the other hand are pretty awesome. So go ahead and turn the lights off at home and play a laser tag game in the dark. The grips of the spaceships are big enough to fit small and big hands, which is great if parents want to play with their children. The buttons are pretty straightforward and easy to use. It must be said though that, because they are made with simple plastic, they do feel a bit vulnerable and perhaps not as robust. But for that price, you can’t really ask for more. Check out this video for a good impression of these laser tag toys and their size. Also take note of the sound effects that may drive you mad, but kids will probably love. The Discovery Kids Spaceship laser tag toys are the perfect entry level laser tag set. At a very affordable price level, young kids will certainly get excited about these action toys. The taggers are easy to use (although setting up can be a bit confusing) and fit well in the hand, however they do feel somewhat cheap. Which is fine at this entry level, as long as they work properly. The sounds effects could also get on your nerves but that’s a matter of personal preference. Kids will love it and that’s the most important thing. Loud, constantly making noise preventing any "sneaking"
Although both toys light-up when turned on, I can get only one activated (by pressing the reset button). Is the fault with the green unit or with me? Double check to make sure you’re correctly activating them with the video below (about the 15 second mark). If you still can’t get them to work, you’ll want to contact the manufacturer or the retailer to exchange/return.